Every now and then I come across a part that makes me want to create a bike around it. It's a round about way to do things, but it works for me. 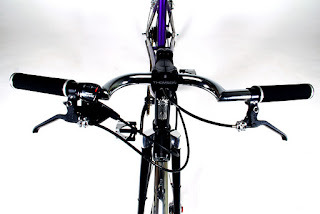 Such was the case last year when I first saw Soma Fabrications cafe racer handle bar. 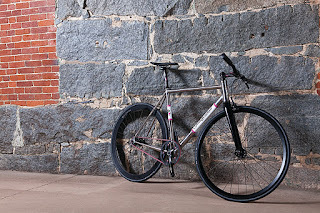 It inspired me to create the Caffeine Racer mixte for my better half. 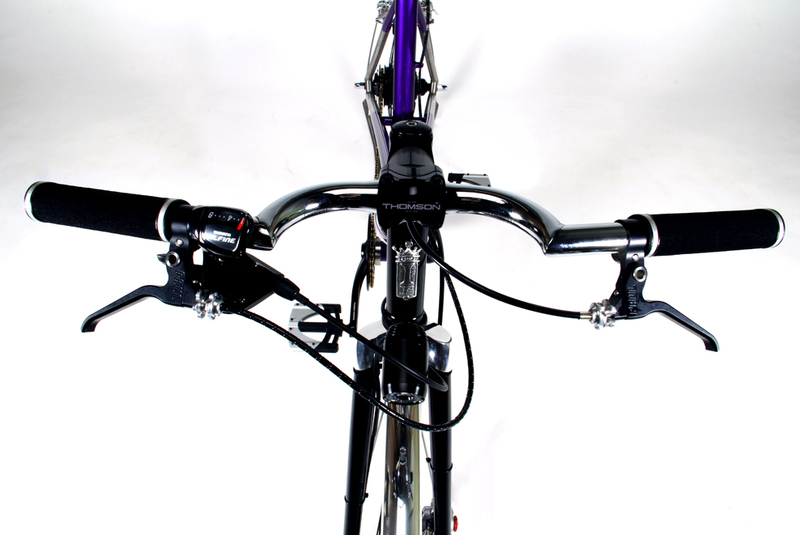 While at NAHBS, I was conveying this story to Paul Tolme, who runs PR for Gates Carbon Belt Drive. 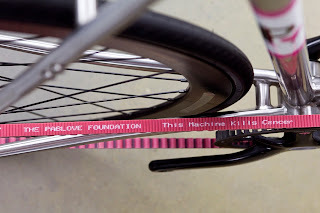 He came back to our booth a bit later and handed me a pink belt that Gates had produced in limited quantities to raise awareness for the fight against childhood cancer going on at the Pablove Foundation, and challenged me to create a bike around it. It wasn't a "double-dog-dare-you" kind of thing, but he was pushing my buttons. At the same show, I received a unique set of shaped stainless steel tubes from our crazy and stylish Italian metal-heads at Columbus. It was obvious... shiny and pink had to go together. With the belt and tube set in hand, the casserole cooking began in earnest. 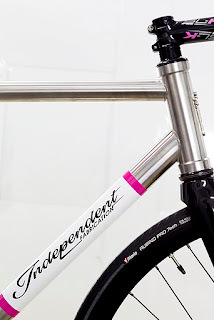 I wanted to make it fixed gear, and incorporate modern standards like a BB30 bottom bracket and an over-sized head tube to accommodate the robust main tubes and an aggressive fork with a tapered steerer tube. After all, it is a war against this disease, so you have to roll with something stout. The shaped chain stays presented a challenge when it came to incorporating a break for adding/removing the belt. Their square tapered bottoms required the splitter to be just below the bridge. The head tube is a story all by itself. 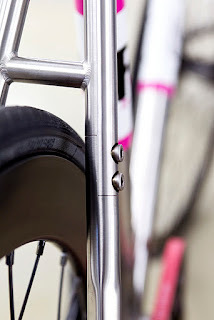 I wanted to use 3T's new tapered steerer road fork, so that meant an oversized HT to accommodate, but no stainless tubing exists in the proper diameter, so in stepped Mark Norstad from Paragon Machine Works. Mark spent 9 hours of machine "spindle time" milling this head tube out of solid stainless bar. 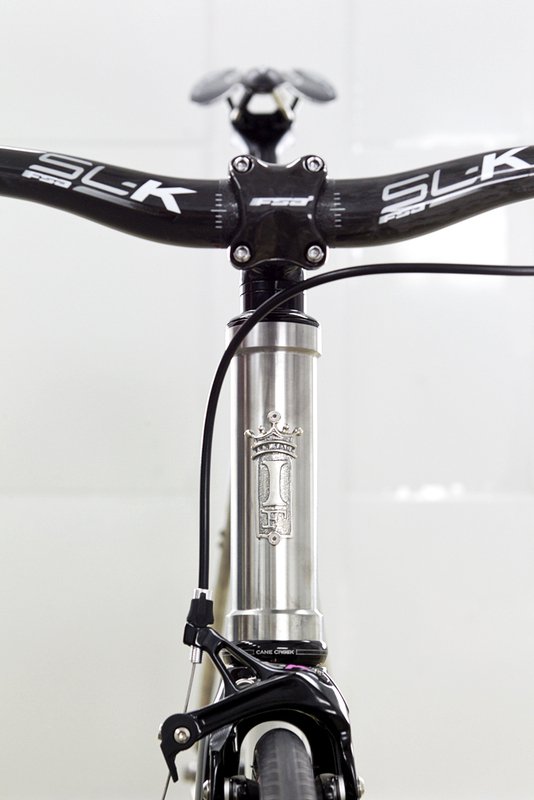 Expensive as it was, I think that it was worth it, since it gives the front end a bit of presence to go with the aggressive fork and over-sized down tube. 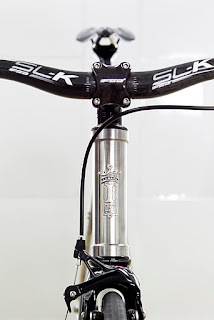 The folks at Cane Creek came through with a unique head set to make it all work together, and the fine folks at Full Speed Ahead added their SLK series bar, stem and post to go along with their BB30 Gossamer Crank. 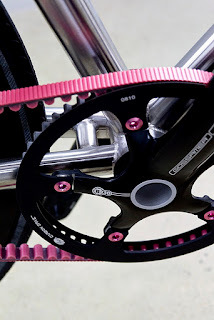 Pink anno chain ring bolts... of course. 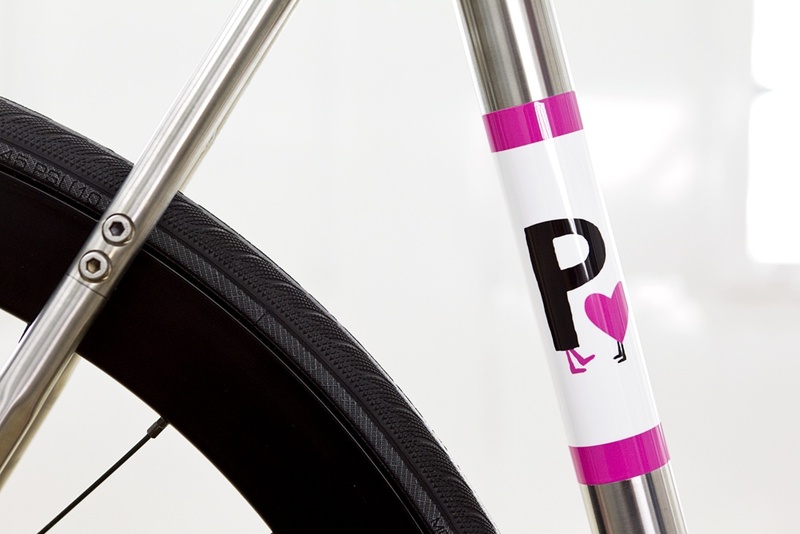 Jedi Paint Master Chris added the Pablove panels on the DT and ST. 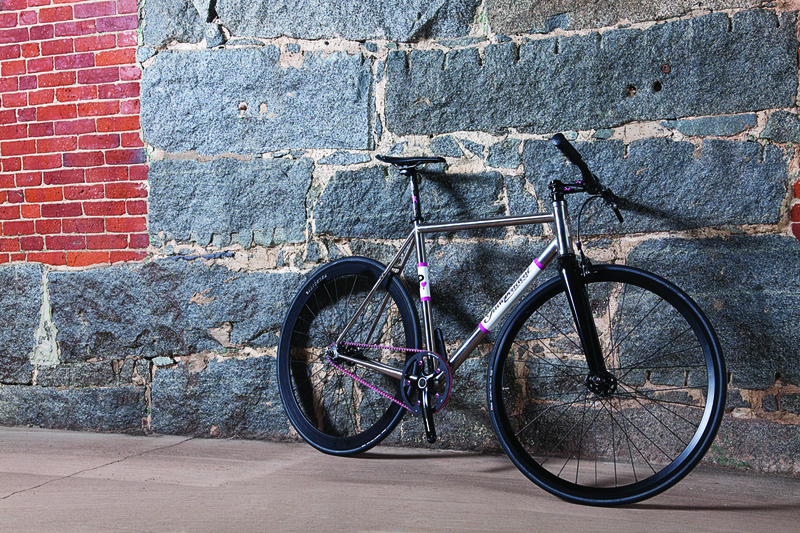 Here she is... a shaped tube, stainless steel, fixed gear, belt drive, cancer killing machine. Stay tuned for details on how you can help kill childhood cancer and win a chance to do it on style on this machine. Those cafe 'bars are cool! That is gorgeous. Going to have to pay attention now.